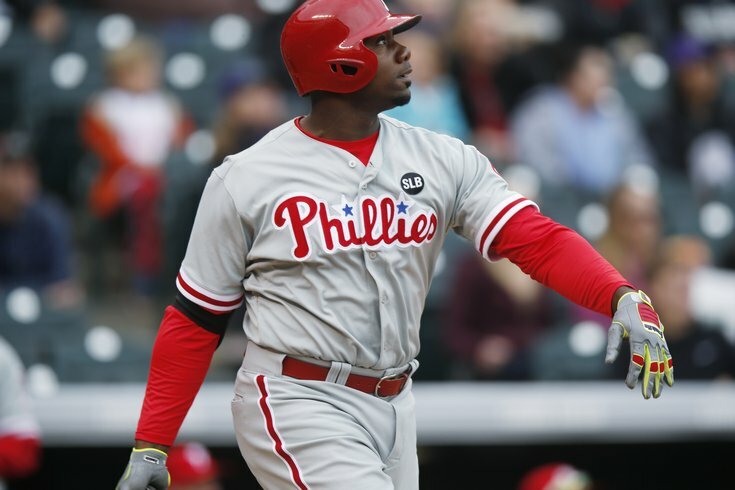 Ryan Howard hit a homer in the fifth inning of the Phillies' 7-3 loss to the Rockies. DENVER — Michael McKenry hit a two-run homer and Jorge De La Rosa became Colorado's career strikeouts leader as the Rockies beat the Phillies, 7-3, on Thursday. Troy Tulowitzki added a two-run single for the Rockies. Brandon Barnes, just recently called up from Triple-A Albuquerque, had four hits. De La Rosa fanned Freddy Galvis on the fourth for this 774th strikeout in a Rockies uniform, moving past Ubaldo Jimenez. The left-hander struck out five in 4 1-3 innings. Christian Bergman (2-0) got a pair of flyouts in the fifth. Jerome Williams (3-4) gave up five runs over five innings in his first start against Colorado in 10 years. He became the third pitcher to go more than a decade between starts against the Rockies, joining Tim Wakefield and Pedro Martinez, according to STATS. With the four-game split, Philadelphia remained stuck on 99 wins versus Colorado. No team has won 100 games against the Rockies outside of the NL West, a feat the Phillies can achieve in a week at Citizens Bank Park. Ryan Howard kept up his torrid hitting at Coors Field, lining a solo homer in the fifth. He is hitting .395 over his last nine games at the hitter friendly field. McKenry gave the Rockies a 5-3 lead with a two-run homer in the fifth. It was his first since Sept. 27. De La Rosa wore down in the fifth and was taken out after Howard's homer tied the game. From there, the bullpen took control, with five relievers allowing no runs and two hits over the final 4 2-3 innings. John Axford got Galvis to hit into a game-ending double play. Phillies: OF Grady Sizemore was out of the starting lineup for a second straight game. He entered as a pinch hitter in the eighth and struck out. Rockies: Manager Walt Weiss said 1B Justin Morneau may not be ready when his stint on the seven-day concussion disabled list is up Friday. "I'm not going to say it's going to be a whole lot longer than that," Weiss said. ... RHP Adam Ottavino said his elbow "doesn't hurt or anything" two weeks after undergoing season-ending Tommy John surgery. "But I wouldn't go out there and try to pitch or anything," Ottavino joked. Phillies: RHP Sean O'Sullivan (1-2, 3.68) takes the mound as Philly travels to Washington for a three-game series. Rockies: RHP Kyle Kendrick (1-5, 6.70) will make his club-leading ninth start when the Rockies open a series against San Francisco on Friday. He's looking for his first win since opening day in Milwaukee.